Parboil bratwurst in water or beer. Remove from liquid when not quite fully cooked. 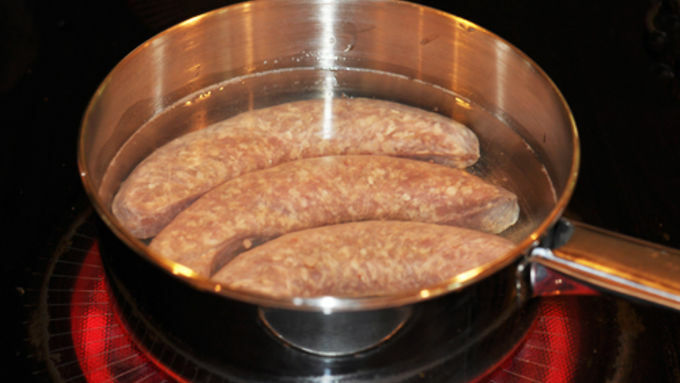 Slice brats into 1/2-inch coins, and set aside. 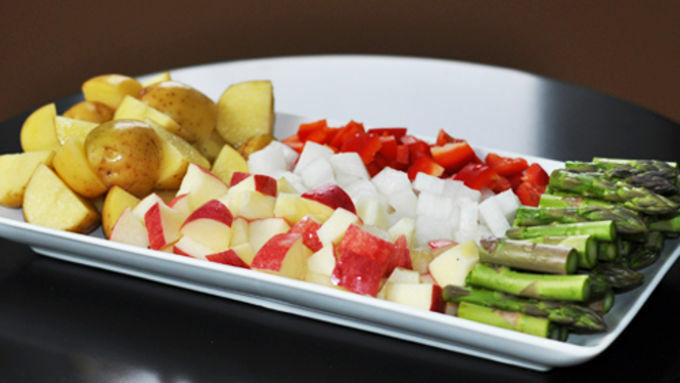 Chop the onion, pepper, asparagus, and potato. Pre-cook potato chunks in microwave until not quite fully cooked. 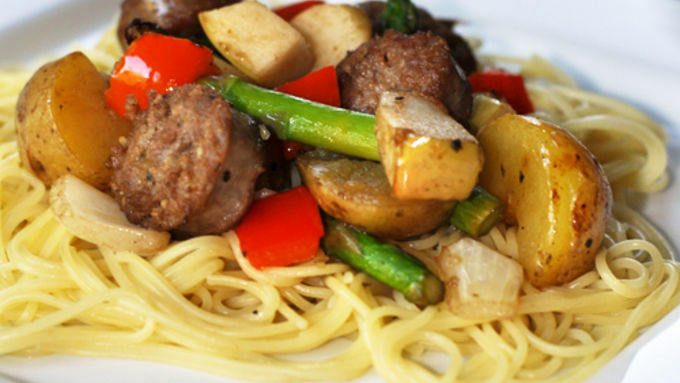 Add chopped onion, pepper, asparagus, and apple to a large bowl. 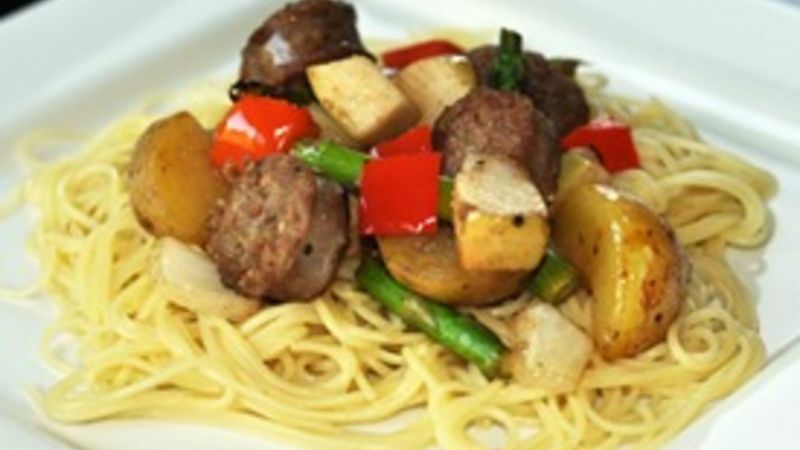 Add the pre-cooked potato chunks and bratwurst coins and drizzle with olive oil, wine, and vinegar. Toss to coat all well. Add seasonings to taste. Toss again and set aside to marinate for a few minutes. Meanwhile, preheat the grill and grill basket to medium-high. Add brat-veggie mixture to hot basket. Close grill lid and cook, 5 minutes at a time, flipping mixture with a spatula to prevent burning. 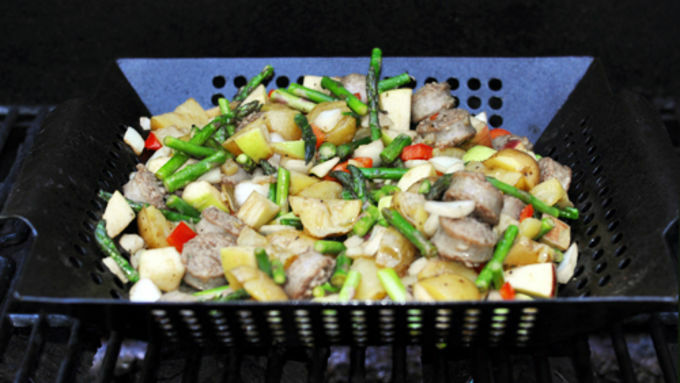 When meat is cooked through and veggies are crisp-tender, remove mixture from grill. Serve immediately over spatzle, sauerkraut, or pasta. All grills heat differently. Monitor yours to make sure it's hot enough to cook the ingredients, but not too hot so they burn. I'm a weenie of a German. I hate the taste of sauerkraut and can't stand beer. So what's a half-German girl to do this time of year, when folks everywhere pick up a stein and brat to celebrate the Old World traditions of Oktoberfest? Punt, that's what. Here's what I had in my fridge after a trip to the farmer's market: fresh bratwurst, beautiful fall apples, a pungent white onion, petite potatoes, red bell pepper, and asparagus. Yes, asparagus. Work with me here. What it turned into was a Bavarian Grilled Brats and Veggies recipe that'll knock your lederhosen for a loop! While the grill works its magic, prep whatever you want to serve this with. Wimpo German me opted out of sauerkraut and opted in angel-hair pasta. It'd be completely amazing over spätzle, too. (Find easy boxed spätzle at the grocery store.) This cooks like a Porsche on the Autobahn, easy and fast, so when the meat is done and the veggies are caramelized and crisp-tender, plate 'er up. All grills heat differently. Monitor yours to make sure it's hot enough to cook the ingredients, but not too hot so they burn. Serve with a big ol' stein of beer. But I gotta say, it tasted mighty fine with red wine, too. Oh, did I forget to mention that I'm also half French?